Wedding Ceremonies may be creative, personal, and symbolic. 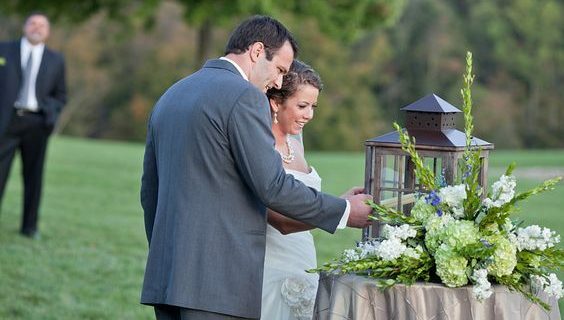 While guests will certainly expect your rings to be exchanged, and vows to be spoken, symbolism is where you can impress. Touches can be incorporated that show your guests your fun, quirky, traditional, or romantic side(s). Symbolism can provide substance to your short & sweet ceremony as well as make a longer ceremony all the more sentimental. I always recommend that a couple’s symbolism make sense to them. So if a couple does not like wine, then a wine exchange during the ceremony, may not be as enjoyable to them. The Unity Candle is a tradition that symbolizes the union between two groups of friends and family. Typically, two white taper candles and one large white Pillar candle is chosen for the Unity candle ceremony; although, I have seen couples choose a variety of Unity candle sizes, shapes and colors. What is special about this Unity candle, is that it may be considered your Family candle: one which is lit during future births, anniversaries, and fabulous celebrations. Just find a prominent place in your home for your Unity candle and mark these amazing blessings with the light that started them all!